The Vaishno Devi yatra is probably the most hallowed pilgrimage of Northern India and attracts over five million devotees a year. It entails a 13.5 km trek from Katra, which in turn is 50 km from Jammu. All pilgrims are required to get passes at Katra for the yatra. The best time to visit is between March and July. And the yatra season is between March - April and September - October. People mostly go for the yatra during these seasons. It is situated at an altitude of 1,700m. The abode of the goddess is in the mountains of Trikuta Hills, in the state of Jammu and Kashmir in north India. The Goddess resides in a beautiful cave in the form of three "Pindis" in the name of, "Maha Kali", "Maha Laxmi" and "Maha Sarawati". According to legends Goddess Durga has killed the demon Bhairon here. The cave is situated at a height of 1,700m. The cave is 30m in length and 1.5m in height.To reach the Vaishno Devi temple you have to climb for four hours from Katra. It is advisable to visit during March to July because the other time of the year is too cold. The main time for pilgrimage is March to April and September to October. Bhumika Temple, which is about 1 km from Katra. Ban Ganga Temple is about 3 km from Katra. Charan Paduka Temple is about 1.5 km from Ban Ganga it is situated at a height of 3,380 feet. Ardh Kuwari is 4.5 km from Charan Paduka and 4,800 ft above sea level. The Sri Ram Temple is another holy shrine. It is near the Vaishno Devi cave. The Bhairav Temple is about 2.5 km from Vaishno Devi cave at an altitude of 6,700 feet. 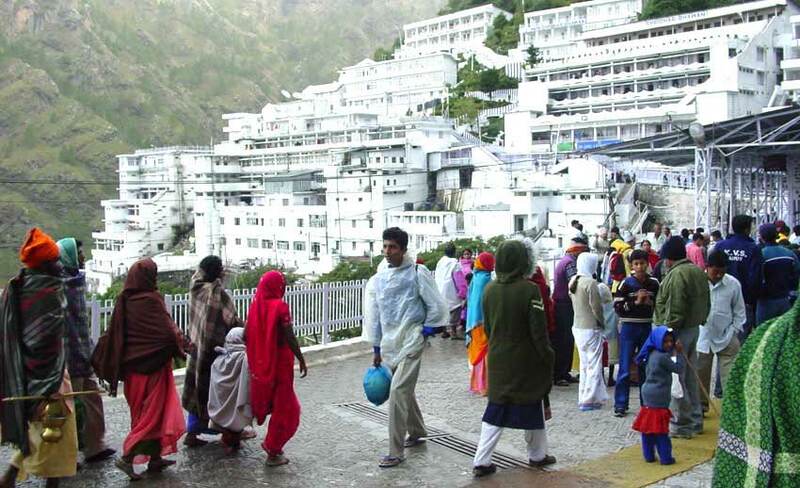 It is a ritual to visit this temple after visiting the Vaishno Devi Temple. To reach Vaishno Devi you can avail air or rail or road. If you go by air then the nearest airport is in Jammu, which is 48 km from Katra. 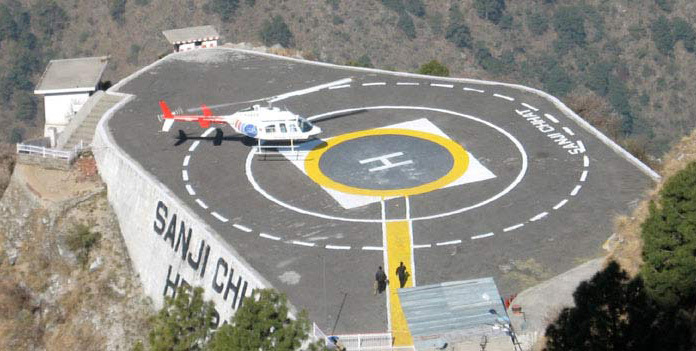 There is a helicopter service that departs from the airport at Sanjhi Chat in Jammu in the morning. If you travel by rail then the nearest railway station is in Jammu, which is well connected to all the major cities in India. By road if you travel there are regular buses leaving for the 52 km trip from the central bus stand in Jammu to where the road ends at Katra. It is a bus journey of 2 hr. From Katra it is a steep 13-km walk. It takes about 4 hours to climb up and 3 hours to come down.